My Impressions: Simon Says Stamp The Color of Fun Release!!! 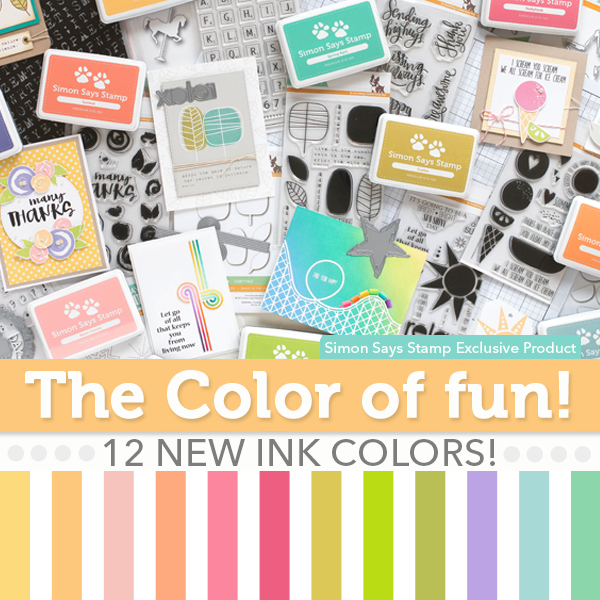 Today is release day for Simon Says Stamp's The Color of Fun product line! I have to say, this one might be my favourite yet! Today I'm sharing a couple of cards and will (hopefully) be back tomorrow to share a couple more. For today's cards I focused on using Simon's new Rockin' Roller Coaster Die and my next post will focus on the new Many Thanks Stamp Set. For my first card I used the Rockin' Roller Coaster Die as it was intended to be used. First I created my background using Simon's new Wisteria, Hollyhock, and Duckling inks with Ranger's Round Ink Blending Tools. I used Simon's new Firework Bursts Dies on the background and added some sparkle with Ranger's Stardust Stickles. I die cut the Rockin' Roller Coaster Die from grey cardstock and found I got the best cut using a shim of cardstock below my cutting plates. (It made all the little pieces come out more easily). I adhered the rollercoaster to my inked up panel using Ranger's Multi Medium Matte and the cars with foam adhesive. I then added some sparkle to the cars with a Wink of Stella Clear Glitter Brush. The sentiment is from Simon's new Cone Building Stamp Set. For my second card, I die cut just the bottom of the rollercoaster structure into strips of Neenah White Cardstock that I had inked up with a number of Simon's new dye inks (Hollyhock, Melon, Duckling, Jellybean, Spring Rain, Blue Jay, and Wisteria). I then adhered the pieces to my card front. I die cut Simon's new Sketch Star Die from both white and black cardstock, adhering the black outline to the full white star. I stamped my sentiment created from Simon's new Grunge Alphabet Stamp Set, and adhered the star to my card with foam adhesive. I then added Glossy Accents over the black star outline and finished things off with various enamel dots. I hope you enjoy The Color of Fun release as much as I do! WOW, I love your ideas, Sarah! What a fun set this is! I love how you've used the bottom of the roller coaster die to make the background! Two stunning cards ... and such clever use of the die! Wow! These are fabulous! Love the fireworks over the roller coaster. So fun!! Love these! Using the roller coaster die for that background is brilliant! Fantastic cards, Sarah! But, that second card really amazing! Love the rainbow colors. Love the first card! So fun. Love the firework in the sky! LOVE the fireworks behind the rollercoaster in the sunset!! Gorgeous card!!! 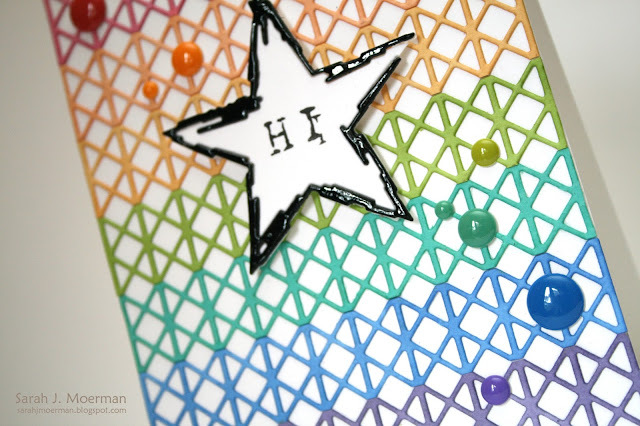 Love the various cards and ways to use stamps and dies in different ways. Thanks for sharing your talent and ideas with us.